You are here: Home / Crochet Other / Link Parties / Party 242 Features: Beautiful Mittens, a Stunning Afghan Block and Sweet Vintage Ribbon Violets. 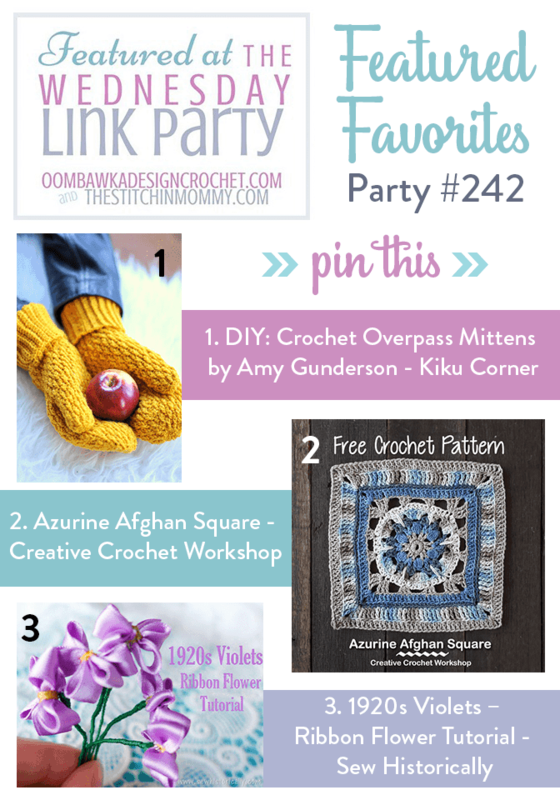 The Wednesday Link Party 242 Features include projects from Kiku Corner, Creative Crochet Workshop and Sew Historically! This week, Kiku Corner shared her finished project for a beautiful pair of crocheted mittens (designed by Amy Gunderson). The pattern is linked in her post. 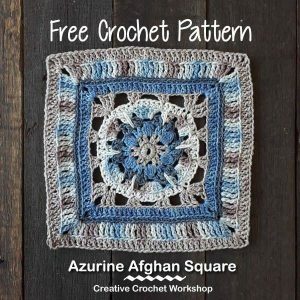 Joanita from Creative Crochet Workshop has crocheted a gorgeous afghan block for the 2018 Crochet A Block Crochet Along. You can make it too with her free pattern! 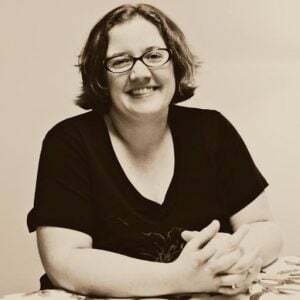 Sew Historically has shared her lovely vintage ribbon violets. 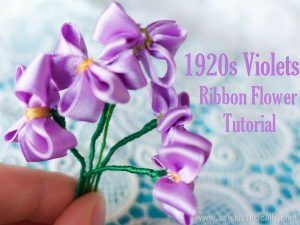 These 1920’s style violets can be made using ribbon and embroidery floss! Check out her free tutorial to learn how to make your own. Welcome to our 242 nd Party! 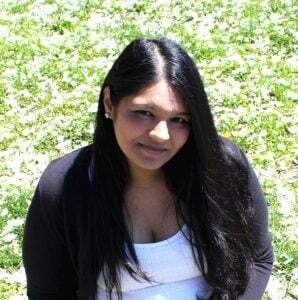 Here are your featured favorites from last week’s Wednesday Link Party – Link Party 241 as chosen by you! **Many of the projects included in the Wednesday Link Party have been created using other Designer’s Patterns. Find the links to the original pattern source(s) included in the Project Posts. If there is no mention of a pattern, please feel free to ask them by leaving a comment on their post! 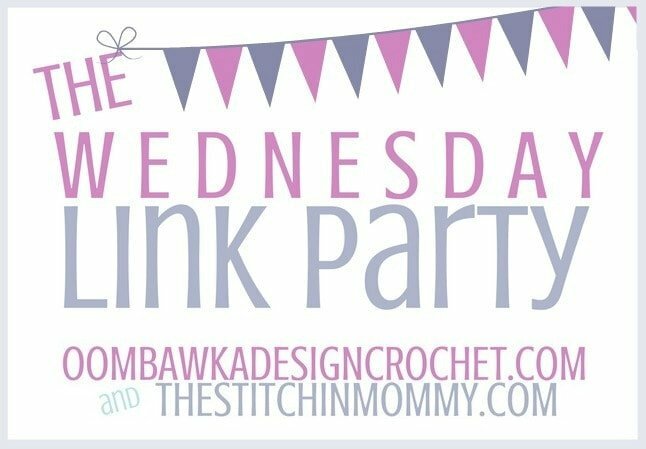 The Wednesday Link Party is hosted by Amy (The Stitchin’ Mommy) and Rhondda (Oombawka Design). If you’d like to share something of ours online, we’d really appreciate it! You can pick any post you’d like! 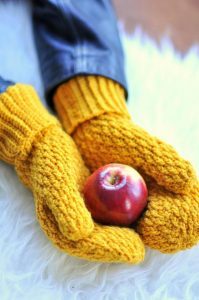 Thanks for featuring our yellow mittens!